I am a huge fan of building toys and discovered the K'NEX brand while I was a Science teacher. I learned right away that K'NEX sets are of the highest quality and always challenge children's imaginations. So naturally, I was thrilled when I found out that K'NEX has a preschool line of building sets and they just happen to be based on Riley's favorite television show, Sesame Street! K'NEX allowed Riley and I to review three of their latest and greatest building sets, Elmo's Chilly Day, Elmo's Rainy Day and Cookie Monster's Sunny Day. Keep reading to find out how Riley liked them! K'NEX has recently introduced three more Sesame Street Building Sets to their collection featuring Cookie Monster and Elmo having fun in different seasons. These small building sets are designed for children ages 2 to 5 years old and contain a Sesame Street character as well as a seasonal "scene" to build. Each set contains either 6 or 7 pieces and is perfect to travel with. 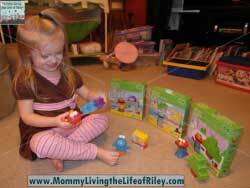 Riley's had the pleasure of reviewing some of the other K'NEX Sesame Street building sets and so she took right to these smaller sets like a fish to water! Each set contains big, chunky pieces which are easy for small hands to build with as well as a play & learn activity sheet for more fun play ideas. Within minutes of playing with these toys, Riley had created a monster conglomerate season featuring all three Sesame Street characters and their seasonal settings. She definitely had a lot of fun playing with all three sets, but it seemed that the Elmo's Rainy Day building set was her favorite for she really liked putting together the rainbow and cloud scene. 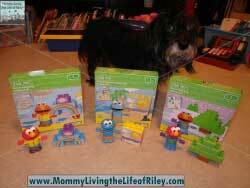 Riley loved the three newest Sesame Street building sets from K'NEX! They all have large parts that she can easily grab and manipulate and K'NEX couldn't have chosen better characters for this age group than those from Sesame Street! The best part is that all of the pieces are interchangeable with their other Sesame Street building sets, so the combinations and possibilities are endless. I love toys that challenge Riley at many different developmental stages as well as foster creativity and imagination, and these Sesame Street K'NEX toys definitely do just that! 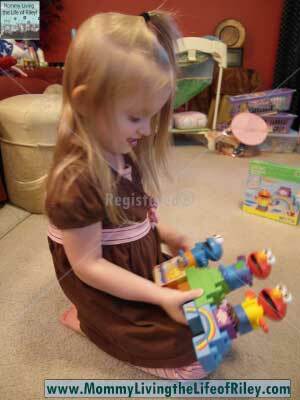 Disclosure: I received the three Sesame Street Building Sets shown above from K'NEX in order to facilitate my review. No other compensation was received. This product review is based on my own personal experiences with this item and is completely honest and objective. Would love to win this for one of my grandchildren.